Biblical Archaeology Review (BAR) has just released its top 10 biblical archaeology discoveries for this past year. For those of you who do not subscribe to BAR but are interested in biblical archaeology, I thought I’d share those top 10 discoveries. I will list them in the order they appear in the BAR article, although it doesn’t appear that the order has anything to do with their significance. I have included many links throughout this post that lead to further information on each discovery, including some video links that I think you’ll find interesting. While all of the discoveries are not directly related to biblical archaeology (i.e., some do not relate to a particular text or event), they do concern the biblical period and give us a broader understanding of the biblical world. The translation of the “Ark Tablet” no larger than a mobile phone is one of biblical archaeology’s great discoveries in 2014. 1. 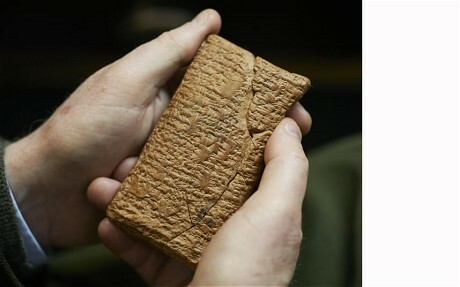 The Ark Tablet–This small mobile phone-sized object has been known about for years, but has only recently been translated by Dr. Irving Finkel who is the curator in charge of cunieform (ancient Babylonian script) clay tablets at the British Museum (you can read his own story about it here in The Telegraph). This tablet dates somewhere between the years 1900-1700 B.C. and describes in detail the building of an ark. Students of Genesis are probably familiar with the fact that there are several ancient versions of a flood that include a hero buidling an ark. Among these are the Gilgamesh Epic and the Atrahasis Epic. These accounts have interesting similarities with the biblical story of Noah, as well as important differences. The Ark Tablet is apparently related to the Atrahasis Epic and describes the ark as a circular vessel, similar to a vessel known as a coracle still used today in some places. Of course, the ark is described as being much larger. One other interesting feature of the Ark Tablet is that it mentions the animals on the boat in pairs (two each, or two by two). For more information you can read Finke’s article in The Telegraph (see link above). Articles are also available at Mail Online, and at BAR’s Bible History Daily (if you’re are a subscriber). Phylacteries containing Dead Sea Scroll texts. Another biblical archaeology discovery in 2014! Photo: The Leon Levy Dead Sea Scrolls Digital Library. 2. Qumran phylacteries revealing 9 new Dead Sea Scrolls–Just to be sure everyone understands what this discovery entails, allow me to provide a few definitions. The Dead Sea Scrolls are, of course, the world-famous discovery from the 1950s that gave us copies of the Old Testament text 1,000 years older than any we had previously. Qumran is the archaeological site believed by most scholars to be the community that produced and/or preserved these scrolls which were discovered in 11 different caves throughout Dead Sea area. Phylacteries (or teffelin–the Jewish word) are small leather boxes containing texts from the Jewish law worn on the forehead or arm by Jews as they recite certain prayers. When a CT scan was performed on a phylactery uncovered at Qumran, it was found to contain a text. This led to a further investigation of other phylacteries at the Dead Sea Scroll lab at the Israel Museum. In total 9 new texts were discovered. It is a delicate process to remove and unroll these texts, so they have yet to be deciphered. When examined, however, they should contribute yet another witness to the ancient text of the Hebrew Bible. For further information on this discovery click on this article in The Times of Israel. The Spring Citadel, a 3800 year old Canaanite fortress recently unearthed. 3. Canaanite Fortress in the City of David–Archaeologists Ronny Reich and Eli Shukron have been excavating in the ancient City of David for the last 19 years. 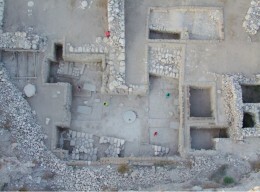 In 2014 a monumental Canaanite fortress dating to the 18th century B.C. (1700-1800 B.C,) was uncovered. This fortress, called the “Spring Citadel” by archaeologists because it protects the Gihon Spring (link = youtube video), is believed to be the fortress referred to in 1 Samuel 5:6-7 that David conquered. It is also the location where Solomon was anointed king (1 Kgs. 1:32-34). The walls are 23 feet thick and consist of stone blocks up to 10 feet wide! This means it is the largest Canaanite fortress ever discovered. The significance of this discovery demonstrates that Jerusalem was an important city in Canaanite times, contrary to the theory of some more liberal scholars who insist that it was no more than a tiny insignificant city in David’s time. For more information see this article at jewishpress.com or this article at the Jerusalem post. You can also view a video at this link. 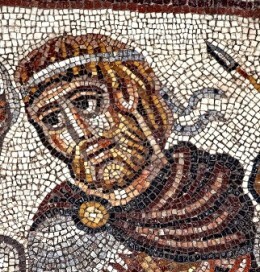 A possible image of Alexander the Great in the Jewish synagogue in Huqoq. 4. Mosaic at Huqoq–Huqoq is a small village in Lower Eastern Galilee, 3 miles west of Magdala (Mary Magdalene’s home). This discovery is not directly related to biblical archaeology, but concerns a possible incident in Jewish history. The Jewish historian Josephus reports that when Alexander the Great was conquering the Persian empire that he stopped near Jerusalem to pay homage to the Jewish high priest and the God of Israel. Scholars are not certain how factual this account is, but recently at Huqoq a mosaic floor has been uncovered in a 5th century A.D. Jewish synagogue that appears to depict this meeting related by Josephus. For more information on the excavation at Huqoq click on this link. The entryway recently uncovered at Herodium. 5. Monumental Entryway to Herod’s Palace at Herodium–Herod the Great had many palaces and fortresses throughout his kingdom. Herodium was one of them and is located 7.5 miles south of Jerusalem and roughly 2 miles from Bethlehem. Based on information from Josephus, Herod is believed to have been buried at Herodium. It is also possible that the soldiers that Herod dispatched to slaughter the children of Bethlehem came from Herodium (Matt. 2:16). The entryway which was discovered consists of a series of arches measuring 65 feet high, 65 feet long, and 20 feet wide. 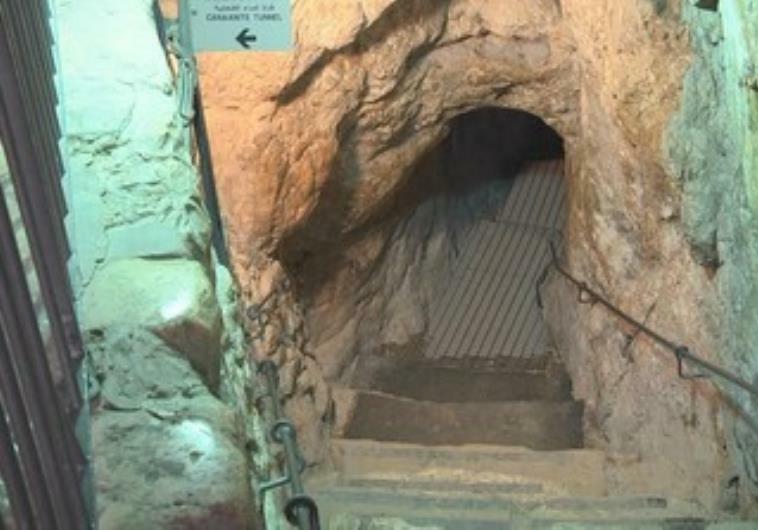 According to the BAR article, “The excavators believe the corridor was backfilled in the process of turning the entire hilltop complex into a massive royal burial mound when Herod became aware of his imminent death.” For further information, click on this link from the Hebrew University of Jerusalem. Coins dated to the First Jewish Revolt against Rome. 6. 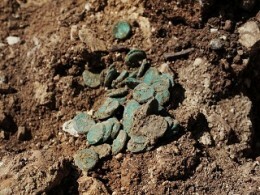 Coins from the First Jewish Revolt–Excavations along a main highway between Jerusalem and Tel-Aviv revealed a house built in the 1st century B.C. and later destroyed in the revolt against Rome in 69/70 A.D. In the ground underneath the house a ceramic box was found containing 114 coins each containing the words, “To the Redemption of Zion,” and dated “Year 4” (meaning the 4th year of the revolt = 69/70 A.D.). The money box was apparently hidden by the owner in hopes of recovering it later. For further information of this discovery see this link on the IAA (Israel Antiquities Authority) Press release. 7000 year old copper awl. 7. 7,000 year-old copper awl–The discovery of a small 4 cm (1.6 inch) awl may not seem significant to some, but actually it has important ramifications. The awl was found in the grave of a wealthy woman who lived in the Jordan Valley around the 5th-6th millenium B.C. 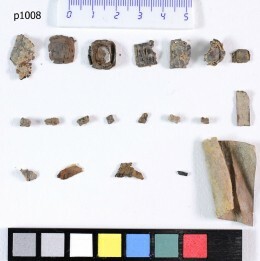 The site is known as Tel-Tsaf, and this discovery demonstrates that metal was available in this area hundreds of years earlier than previously thought. The importance of this discovery, the Canaanite fortress mentioned above (see #3), and the Canaanite Temple mentioned below (see #8), is that all these discoveries suggest much more advanced conditions in ancient Canaan than archaeologists and scholars previously thought. 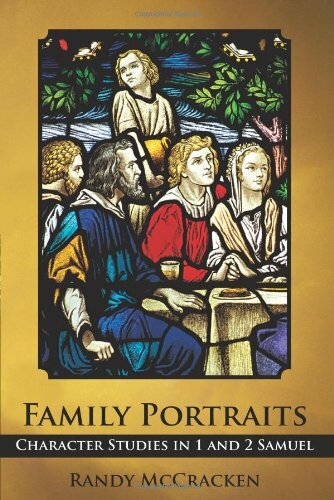 This understanding supports the biblical portrayal of an advanced culture in Canaan very well. Some scholars have attacked the biblical account believing that authors who lived much later (e.g., the exilic period) projected their own culture back on the time of the patriarchs and early Israelite period. In other words, the argument by these scholars is that the biblical writers wrote anachronistically. But the discoveries that continue to be made seem to support the idea that the biblical authors knew what they were talking about! 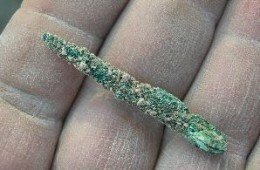 For more information on the discovery of this awl click on the following link from sci-news. The great temple complex at Megiddo reveals a more complex society than previously thought. 8. The Great Temple at Megiddo–The discovery of a very large Early Bronze Age I (3500-3300 B.C.) temple at Megiddo, six times the size of an average temple of its type, was a complete surprise to archaeologists. A temple of this size requires a complex social and political structure that was not believed to exist in the Levant (the geographical area comprised of Syria, Lebanon, Israel, Palestine, and Jordan) during this time. The temple is the most monumental structure so far uncovered in the Levant during this time period. Archaeologists have also been excavating an area to the east of Megiddo known as “Tel Megiddo East,” which provides further confirmation that during the Early Bronze Age I a prosperous and complex society existed at this location. This challenges the view which saw this area and time period as consisting of only small village societies. See my comments in #7 above for the significance of this new evidence. More information is available at this link and especially at this link at ASOR. For general information on the biblical significance of Megiddo, see my article here. 9. Social status and the Copper mines at Timna–The Timna referred to here is not the Philistine city known from the Samson story (spelled Timnah–Judg. 14:1), but the Timna of ancient Edom located south of the Dead Sea. This area was famous in the ancient world for its copper mining. Being forced to mine copper was one of the most terrible fates a person in the ancient world could imagine. It was reserved for the lowest of slaves, usually criminals. Until recently it was assumed that those involved with copper production were all slaves. But a recent study of animal bones suggests that the industrial workers had it better than the slaves in the mines. 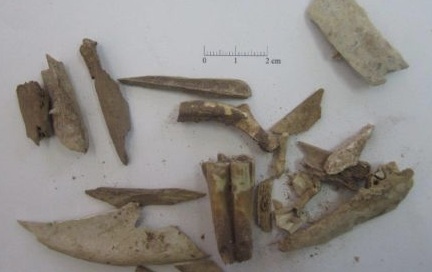 Researchers contend that the animal bones in the industrial area demonstates that they received better cuts of meat than the slaves in the mines. Examination of ancient peoples’ diets by examining animal bones, plants, and grains that remain in ancient bowls are just some of the more interesting ways that archaeology is helping to present a more nuanced view of ancient society. For a more indepth treatment of this topic click here. 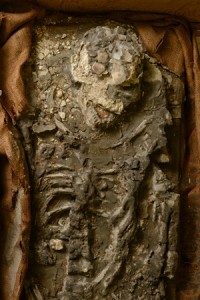 6500 year old skeleton from Ur. 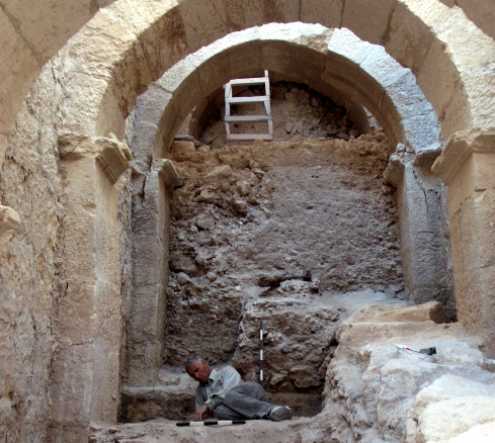 So this is BAR’s top 10 biblical archaeology discoveries for 2014. Some, like the phylacteries and our skeleton friend from Ur, might be more properly termed “rediscoveries.” Others, it could be argued, have little to do with “biblical archaeology,” but nonetheless they are interesting and they help to paint the bigger picture of the ancient Near Eastern world. I love this! Thank you SO much for posting it! Thanks Suzanne, you are welcome!